23M w/no known medical history presenting with abdominal “ball” x10d. Patient denies pain, and is tolerating regular diet w/o N/V. Reports lifting weights. 23M ċ inguinal hernia, currently asymptomatic with no evidence of incarceration/strangulation. Recommend follow-up at city hospital for evaluation and possible surgical repair. Advised to refrain from strenuous activity, heavy lifting. 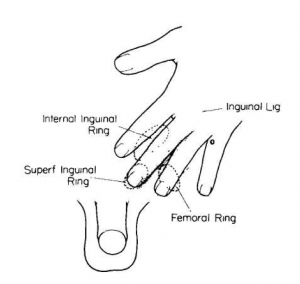 Palpation: place hand over patient’s groin (see figure), with two fingers each superior and inferior to the inguinal ligament. Have the patient cough and feel for a palpable bulge or impulse. 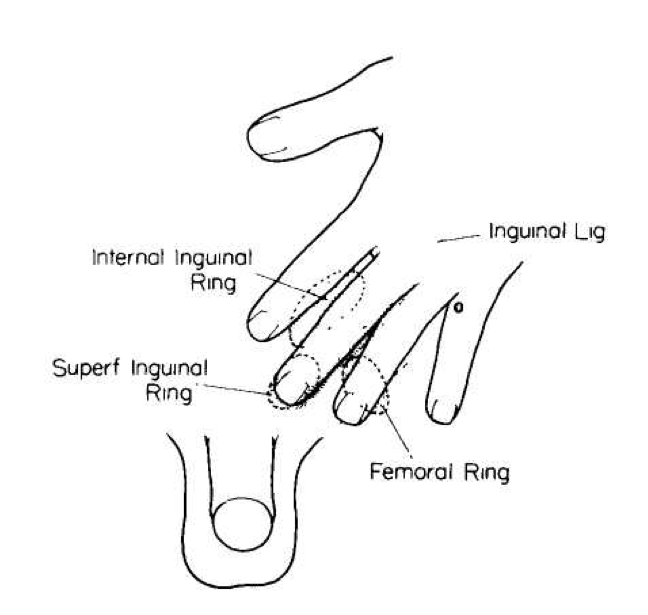 GU: With a finger in the inguinal canal, bulges felt against the side of the examining finger are direct hernias, while those felt at the tip of the finger are indirect. 3. 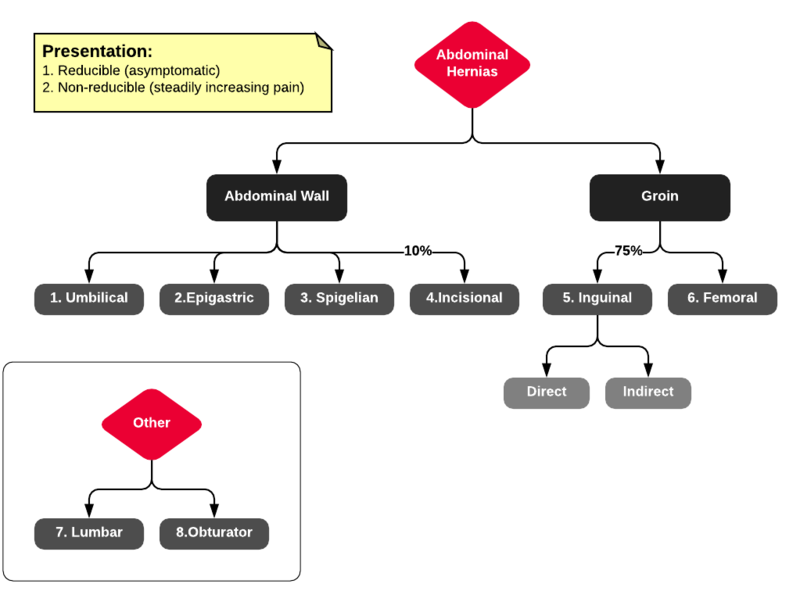 Spigelian Semilunar line: along the lateral borders of rectus abdominus. 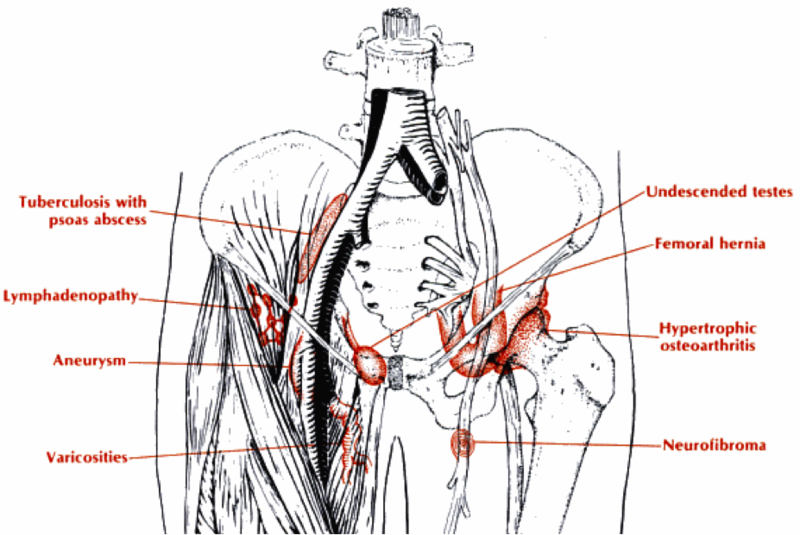 Herniation typically occurs caudally (below arcuate line) due to absence of posterior rectus sheath. 4. Incisional Site of prior incision Poor fascial healing possibly due to: infection (increased risk in wound dehiscence), obesity, smoking, immunosuppression excess wound tension, CT disorders. 5. Inguinal Indirect: internal (deep) inguinal ring, lateral to inferior epigastric vessels.Direct: external (superficial) inguinal ring, medial to inferior epigastric vessels. Indirect > direct. 7. Lumbar 3 Arise in two anatomical triangles:Superior lumbar triangle – lateral border internal oblique, medial border erector spinae, superior border 12thrib.Inferior lumbar triangle – lateral border external oblique, medial border latissimus dorsi, inferior border iliac crest. 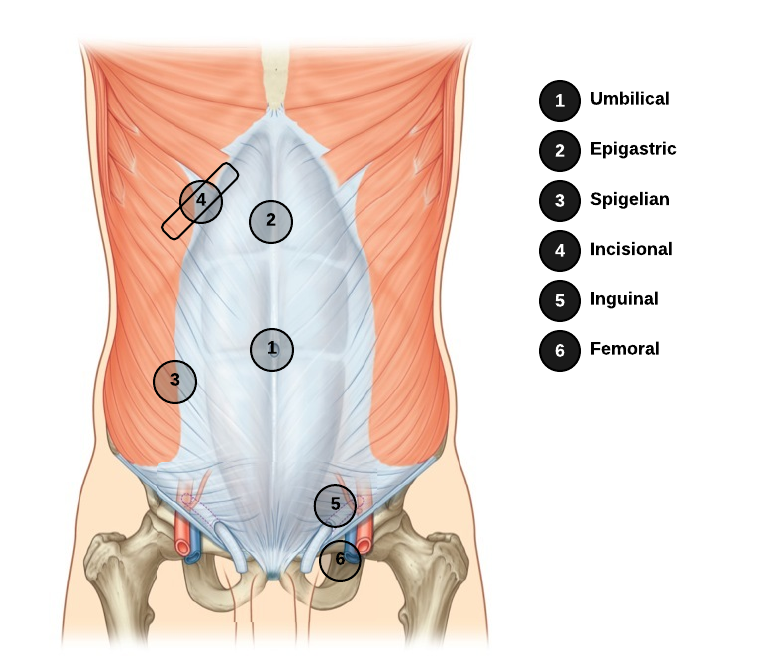 (See figure) Associated with surgery (incisional), typically urologic. 8. Obturator Protrusion of peritoneal sac through obturator foramen. Rare, occur primarily in elderly women (high predisposition for incarceration). Guillem, P., Czarnecki, E., Duval, G., Bounoua, F., & Fontaine, C. (2002). Lumbar hernia: anatomical route assessed by computed tomography. Surgical and radiologic anatomy : SRA, 24(1), 53–56. Shadbolt, C. L., Heinze, S. B., & Dietrich, R. B. (2001). 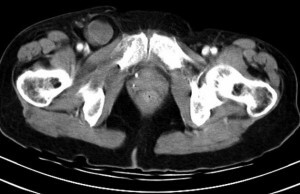 Imaging of groin masses: inguinal anatomy and pathologic conditions revisited. Radiographics : a review publication of the Radiological Society of North America, Inc, 21 Spec No, S261–71. Eyre, RC. Evaluation of nonacute scrotal pathology in adult men. In: UpToDate, Rose, BD (Ed), UpToDate, Waltham, MA, 2013. Foster, D. C. (2002). Vulvar disease. Obstetrics and gynecology, 100(1), 145–163. Collins, R. (2008). Differential diagnosis in primary care. Philadelphia: Lippincott Williams & Wilkins.